Photo Rejuvenation is one of the best ways to improve your skin's appearance and have a more youthful and brighter glow. It can also improve abnormal skin conditions like Rosacea, hyper-pigmentation, acne scars and broken capillaries. Knowing your options and understanding how your skin reacts to these treatments should be a good first step to having beautiful skin. If you have broken capillaries, liver spots, age spots, red flushing skin and Rosacea, going through a Photo Rejuvenation series will do wonders for you. Using the advanced fluorescent technology, certain tissues are targeted and treated with light. This triggers and stimulates the production of collagen. Collagen as we know is the foundation of our skin. 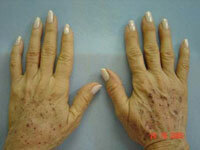 It holds the veins and capillaries which may lose its elasticity as we age. In undergoing Photo Rejuvenation, pigmentation and redness are eliminated or softened while other tissues are not affected since the light is only focused on a certain area. The process only takes a few minutes - 15 to 45 minutes depending on the size of the area. There is anesthetic treatment available prior to the Photo Rejuvenation process but skipping this is not bad at all. The sensation is like a snap of a rubber band on the skin as pulses of light are delivered. After the treatment, it is important to follow the instructions provided by the doctor. Always use sunscreen and avoid using harsh cleansers. This procedure is allowed on any part of your body or face that you want visible, tangible results. Three to five treatments are recommended with a 3 week interval between each treatment for continuous healing and improvement of the skin. You can maintain your series of treatments by having one performed yearly.